A centennial celebration with a full-size pickup truck. 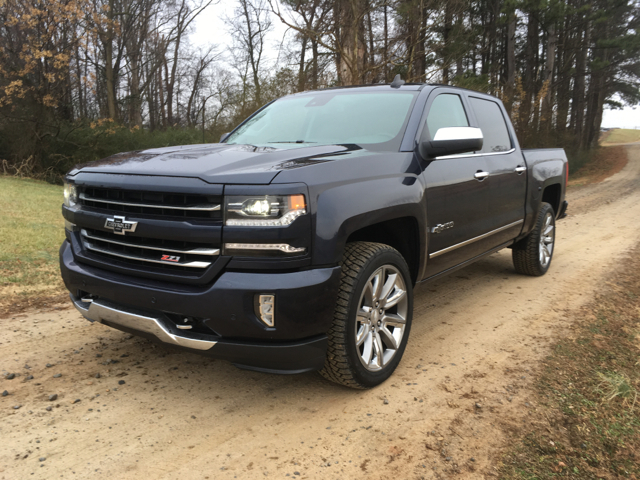 2018 Chevrolet Silverado 1500 LTZ Z71 Centennial Edition. One hundred years ago, the Chevrolet Motor Car Company and the McLaughlin Car Company merged, with the new entity becoming the Chevrolet Division of General Motors. 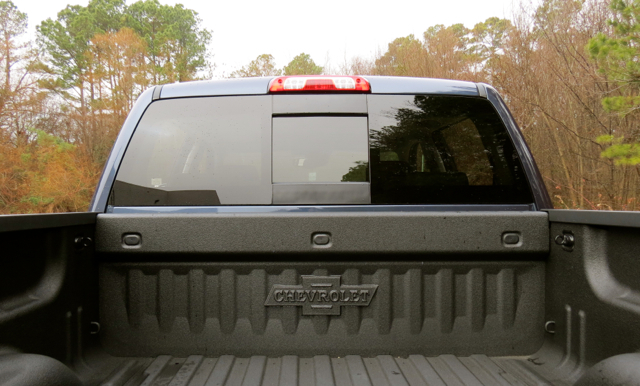 That transition promptly gave Chevrolet access to GMC’s truck platform and the first one-ton Chevrolet truck was born. It didn’t take long for GM to make Chevrolet its mass production division, but one thing hasn’t changed: GMC and Chevrolet trucks continue to share platforms for light- and medium-duty trucks, vans and SUVs. Chevrolet was formed in 1911 and marked its centennial with the Centennial Edition of the 2012 Chevrolet Corvette. But the second centennial is also worth celebrating — the start of Chevrolet truck production. So, Chevrolet did what you’d expect: the company released Silverado 1500 (LTZ Z71) and Colorado Centennial (Z71) editions for the 2018 model year. What’s certain to appeal to passionate Chevrolet truck owners are the special features, including heritage bow tie emblems and Centennial door badges, a spray-in bedliner with heritage bow ties, Centennial edition badging on floor liners, a Centennial Blue exterior, 22-inch premium silver-painted wheels with chrome inserts, and chrome tow hooks, door handles, mirror caps and belt line. The look is at once handsome as it is elegant — it also makes a fitting rolling tribute to one hundred years of Chevrolet truck building. The Centennial Edition is a $3,480 upgrade and is added to a truck already costing $50,000. Obviously, that limits buyers to a committed and financially able few. 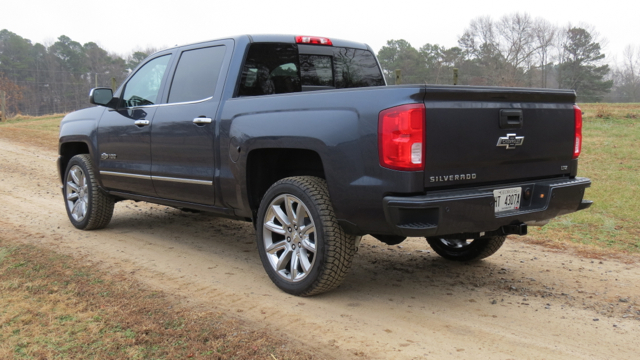 On the other hand, if you like the Colorado, your cost will come in right at $40,000 for a similarly attractive truck. 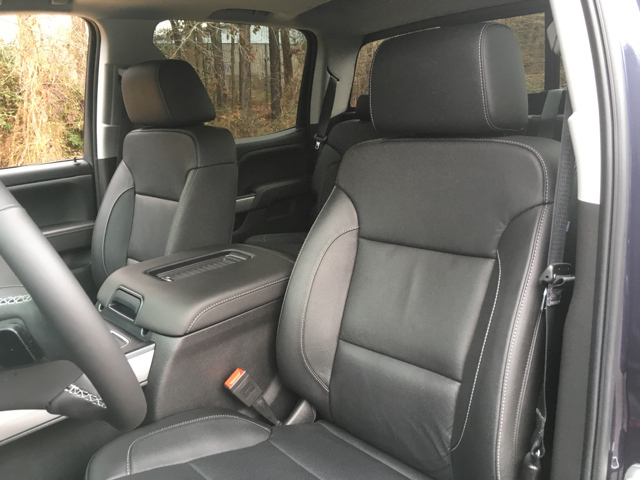 The Silverado offers two premium trims: LTZ and High Country. 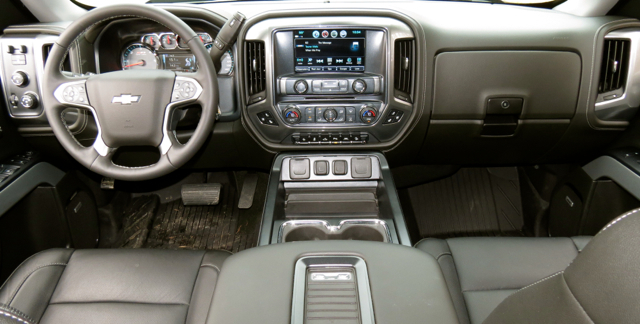 That the Centennial comes only in the LTZ grade means your truck has nearly every option included. Starting with the exterior, you’ll find such items as full LED projector-beam headlamps, fog lamps and tail lamps. You’ll also find chrome front and rear bumpers, two recovery hooks up front and one attached to the frame in the back, power-adjustable and heated side mirrors with turn signal indicators, bright-machined aluminum wheels and a remote locking tailgate. Important mechanical equipment includes a two-speed active transfer case, a four-position drive knob, an automatic locking rear differential, upgraded engine and transmission coolers, and a heavy-duty battery and alternator. 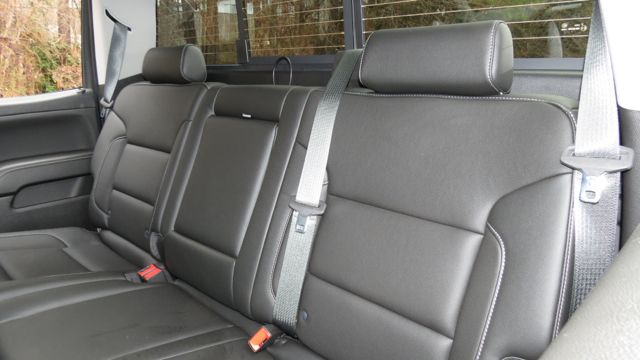 Inside, the creature comforts run deep and include such items as leather covered seats, heated front seats, 10-way power front seats with lumbar support, dual-zone climate control, Chevrolet MyLink audio with an eight-inch touch-screen, HD Radio, satellite radio and a six-speaker audio system. 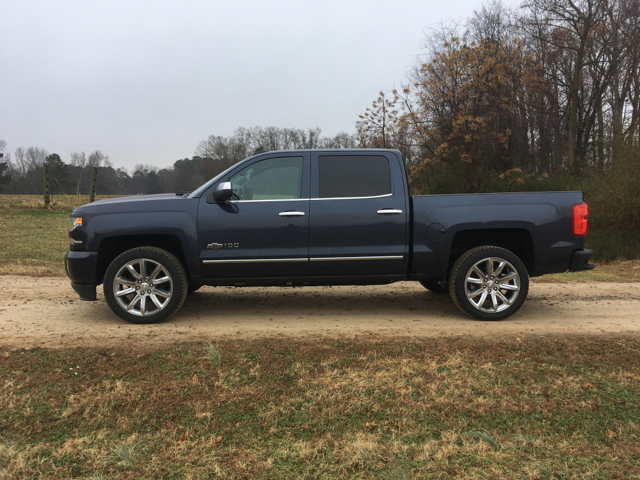 My test model added Z71 trim, including an Appearance Package, spray-on bedliner and off-road suspension with Rancho monotube shocks. 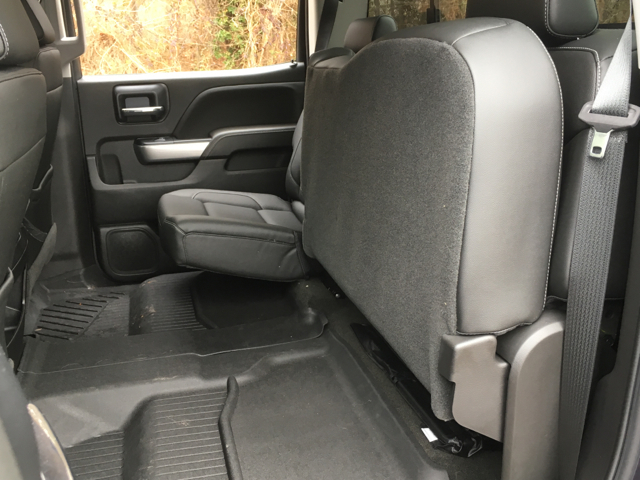 Available packages include an Enhanced Driver Alert Package ($945, with safety alert seat, automatic high beams, front and rear park assist, and forward collision alert) and an LTZ Plus Package ($1,195, with power-adjustable pedals, front and rear park assist, Bose audio system and a heated steering wheel). Also available is a Redline Edition ($2,265, with door and tailgate emblems, body color trim and 20-inch black-painted aluminum wheels) and a Street Package ($1,995, with cat-back performance exhaust, tonneau cover and floor liner). 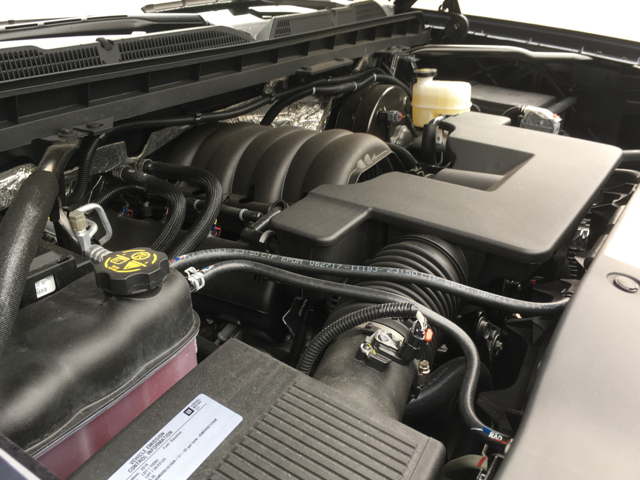 Under the hood of the four-wheel drive Silverado 1500 Centennial Edition is a 5.3-liter V8 engine, generating 355 horsepower and 383 pound-feet of torque. That’s about 325 cubic inches for those of us who prefer the traditional measurement. In any case, Chevrolet utilizes an eight-speed automatic transmission to send power to the rear wheels or to all four wheels with 4WD activated. 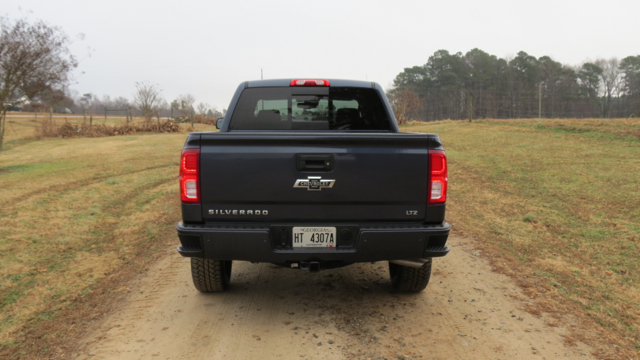 This V8 is the middle of three engines Chevrolet offers across much of the Silverado 1500 line. The base engine is a 4.3-liter V6 with 285 horsepower and 305 pound-feet of torque. On the other end of the spectrum is a 6.2-liter V8 with 420 horsepower and 450 pound-feet of torque. The middle engine hits the sweet spot for most Silverado owners and still manages to pull 11,700 pounds when properly equipped. So, what about the transmission? With eight forward cogs, there must be something special about it, right? Well, the transmission gets the job done, shifting smoothly up and down the band curve. Unfortunately, it doesn’t offer a fuel efficiency benefit —its EPA fuel numbers are unchanged since upgrading from six to eight gears in 2016. Off-roading in my area is possible, provided I head about 20 minutes south where open land is abundant. The local terrain is clay with fire clay rocks scattered nearly everywhere. After it rains, you’ll find numerous puddles, especially on trail grooves and ruts. The only thing you must be mindful of is that some quagmires are deeper than others. If you go off-roading by yourself, there is always a chance you’ll get stuck and need to summon help. Then again, that also becomes an opportunity to test the full capabilities of any four-wheel drive system. 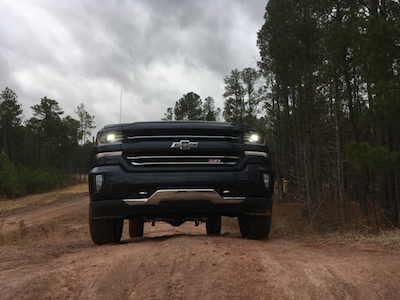 The Silverado is a ready off-road warrior and includes an “auto” setting on the drive dial to automatically engage the front wheels as needed. Some claim the setting reduces fuel economy slightly as it passively engages the front differential. In any case, switch to 4-Hi the moment your front wheels touch a trailhead and you’ll forget everything else. Until you are stuck in said quagmire. 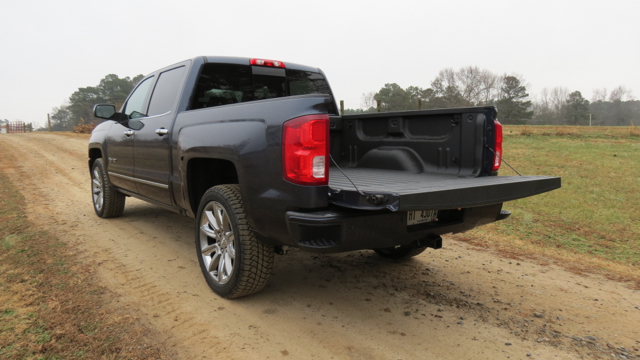 The Silverado’s sheer mass works to its advantage, enabling this 5,300-pound truck to pound its way across the toughest terrain. On the other hand, its sizable footprint could under certain conditions cause it to get stuck. Happily, engaging 4-Lo, applying increasing pressure to the gas pedal and turning the front wheels from side to side should free you. 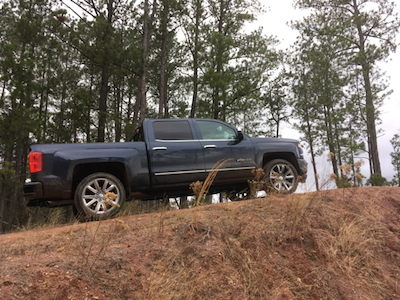 My only off-road challenge with the Silverado had everything to do with the approach, break-over and departure angles. Try as I might, I could not find the “degrees” by which to gauge them. I searched through Chevrolet’s specifications and catalog to no avail. 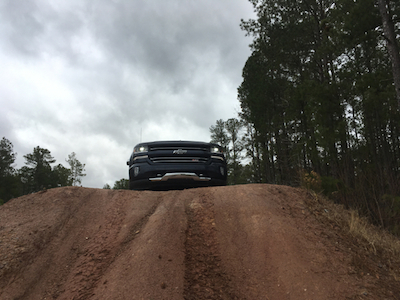 Then again, I did what any thoughtful off-roader does — I sized up every obstacle first before attempting my climb. It also helped I had about a foot of ground clearance at the ready thanks in part to the 22-inch tires. Modern technology is a big help when it comes to four-wheeling. As long as you don’t mind the instrument panel sounding warnings as you make your descent, you’re probably okay. Either way, you’ll soon gauge whether the approach (attack) angle is sufficient for whatever you’re driving. Just don’t become alarmed by the many warnings — use them to aid you as you go. 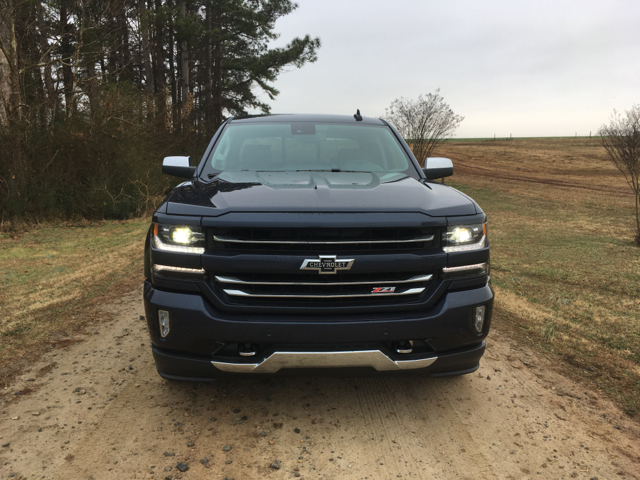 Whether you’d consider the Centennial edition or not, the Silverado ticks off all the right boxes for a large pickup truck. If there is a downside to consider there are actually two: cost and fuel economy. Happily for the Chevrolet fan, if either is a significant concern, then the medium-sized Colorado provides a more affordable and efficient option to the bodacious Silverado.